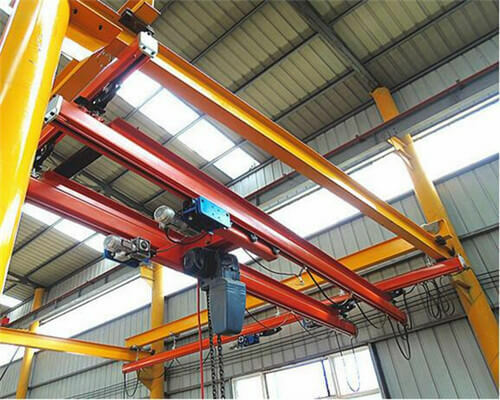 Top running overhead crane is a hot sale crane kits series with multi-function feature and has varied specifications. 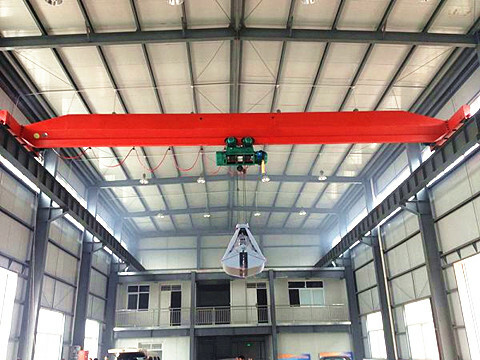 The crane kits factory shall be obliged to the top running crane in designing, manufacturing, shipping, installing and field testing. 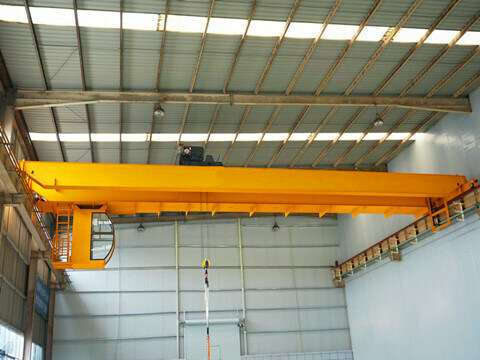 And the general specification of the top running bridge crane includes single girder, double girder, top running overhead crane with one low headroom, electric wire rope trolley hoist. 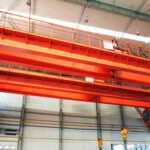 Girders are designed to resist all vertical, horizontal and torsional forces. Bridge girders are branded new, ASTM A992 Hot Rolled structural steel shapes designed to meet the requirements of all the international standards. End trucks are constructed of structural steel tubes, providing a rigid structure. Design can allow easy wheel removal and exchange. End trucks are perfectly fitted with shock absorbing bumpers. 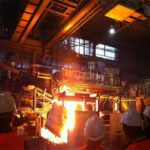 Crane wheels are high strength ductile iron, machined with double flanges and straight threads, flame hardened to 300 Bn. Wheels are sized to meet the minimum allowable wheel loads per CMAA. The wheel axle assembly rotates on dual high-quality anti-friction, lifetime lubricated bearings having a minimum life of 5,000 hours. The end truck to girder connection is bolted for easy removal of the end truck. 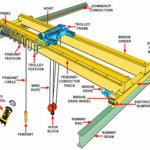 Bridge girder are copied to provide the highest possible positioning of the runway beams. 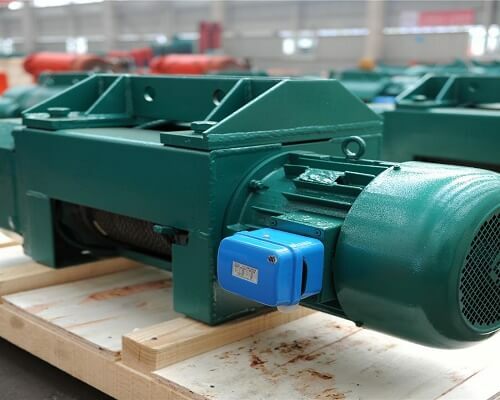 Hoist motor is developing sufficient power to lift the rated load at the specified speed. Motors is TENV, Class F insulated with a temperature activated switch, 30 minutes rated, 1800 RPM. And we approve that the hoist motor will not be placed inside of hoist drum. 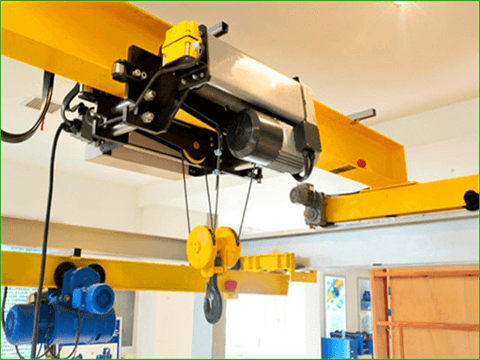 The electric chain hoist has a DC rectified disc type motor brake. Brake material shall not contain asbestos. 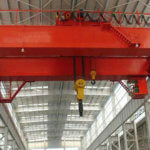 Hoist gearing is helical, heat treated alloy steel and shall operate in an oil bath. The rope drum is welded construction, deep grooved and precision machined to give maximum rope life. A drum is supported at each end by sealed anti-friction bearings. 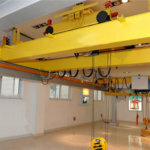 The hoisting rope is of proper design and construction for host service. The rated capacity of bridge cranes divided by the number of parts of rope does not exceed 20% of the breaking strength of the rope. 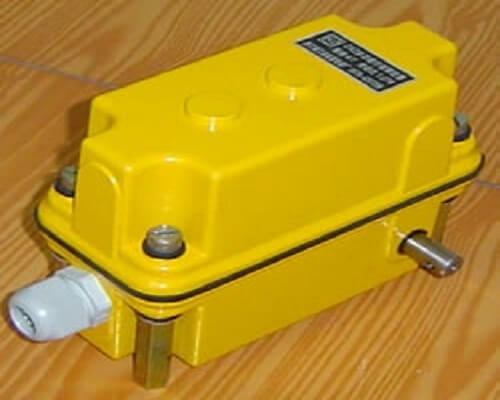 Bottom block has a totally enclosed housing fabricated of steel. The rope sheaves can be supported on an anti-friction thrust bearing. The hook is a single barbed type hook as supplied by Crosby and shall be equipped with a heavy spring safety latch. 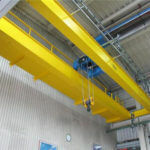 The hoist can be equipped with upper and lower limit switches as well as a redundant block operated the upper limit switch. The switches are adjustable to set the extreme upper and lower limits of hook travel. 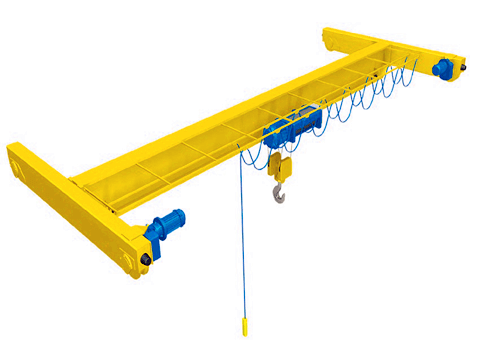 Hoist is equipped with an overload device to prevent lifting loads in excess of 125%. 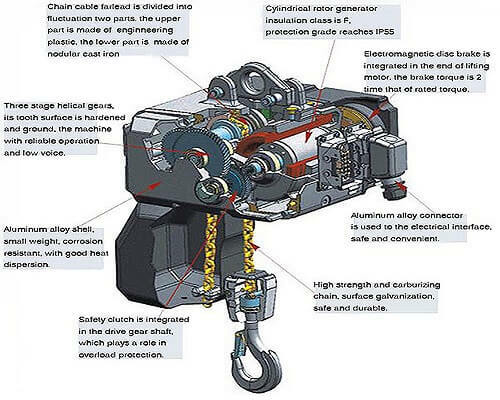 All the above technical spotlights are certifications approved and ensure us Ellsen provide high quality and high-performance crane for our clients all around the world. 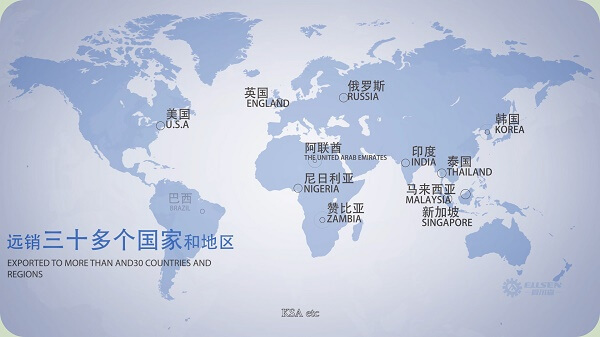 What services we can offer for you? On-site training of operators will be provided by the top running bridge manufacturer – Ellsen. 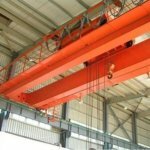 This will include but not necessarily be limited to techniques of safe operation, daily and monthly inspections, minor troubleshooting. 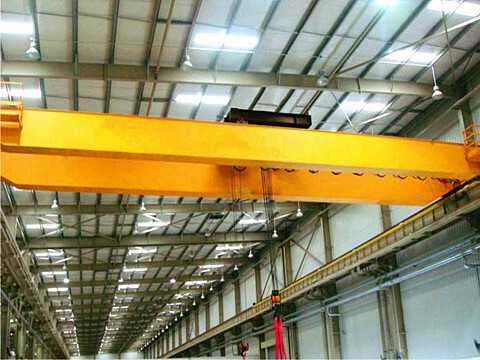 If you need such services, when you make your order, you shall inform us of all the cranes’ services you need us to provide for your side. 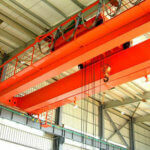 What do you need to provide to have your own special top running overhead crane? Submit for approval, Shop Drawings showing complete details, dimensions, field coordinates and bills of material for fabrication and erection. Drawings shall include a “Wet Stamp” by a Professional Engineer, duly licensed in the State of Us. Include member sizes, model numbers, specifications, reactions, and complete shop and field notes such as welding symbols, paint requirements, bolt sizes, etc. Submit complete calculations for member sizes, horsepowers, design criteria and seismic calculations stamped as per 1. above. Provide information on all components, sub-assemblies, control systems, mechanical features, etc. relating to the equipment supplied under this specification. Include brochures, catalog cuts, parts breakdowns, operation and maintenance manuals, clearance diagrams, dimensional data (not supplied in the shop drawings) and any other data necessary for the engineer to determine compliance with specifications. 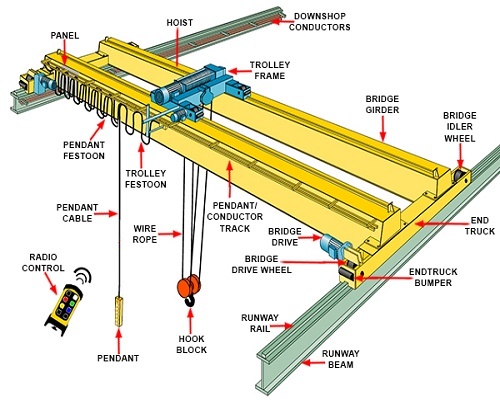 Provide complete, integrated wiring diagrams for all the equipment provided under this specification on crane supplier’s letterhead. Catalog cuts will not be acceptable. 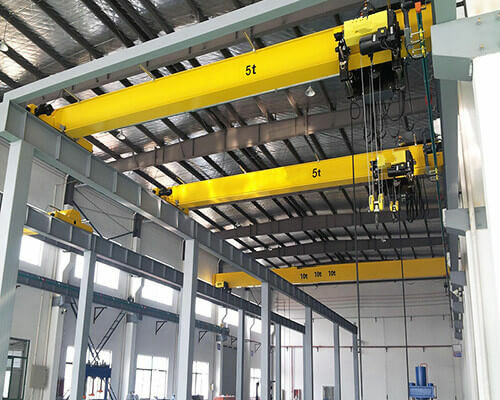 The more specific information you give us about the crane specification, the more specific we can arrange a bridge crane that best fit for your workstation or warehouse, etc. 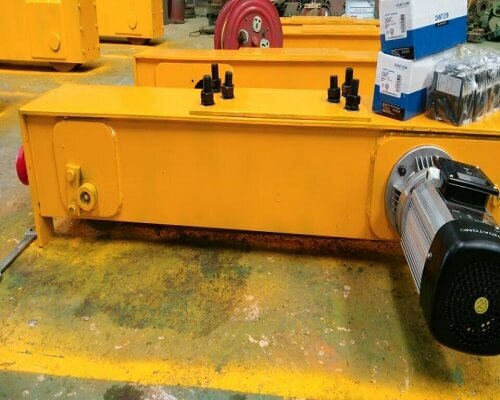 Bridge drives shall employ fixed axles with totally enclosed motors. Trolleys shall employ two drive wheels. Motors shall be TENV, Class F insulated with a temperature activated switch in the winding, 30 minutes rated, 1800 RPM. The gear reducers shall be fully enclosed with an oil bath for gear. 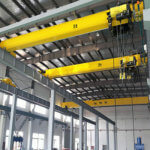 With all the above top running crane solutions, be free to contact us if you intend to buy a top running crane.